Despite the ongoing "Yellow Vests" protests, Paris is striving to replace London as Europe's financial trading hub for foreign investors following Brexit. 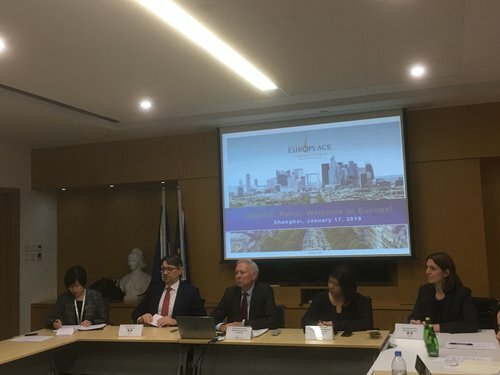 On the occasion of his visit to Shanghai on January 17, Arnaud de Bresson, CEO of Paris EUROPLACE, an organization in charge of promoting and developing the financial marketplace in Paris, noted the group's priorities and actions to consolidate its leadership position in a post-Brexit EU. "If Brexit is inevitable, London's influence as the financial center would be reduced, which would give rise to a new network of financial hubs in the Europe Union. Paris hopes to lead in this reshuffle and attract more Chinese banks and investors," said de Bresson during his business tour through Shanghai to promote Paris as a financial center. In the context of Brexit, a Parisian financial center has the best to offer Chinese and international banks and investors, according to de Bresson. He pointed out that Paris enjoys four advantages that may give it an upper-hand, including strategic geographical positioning, a wide range of complete and diversified financial services, a leading ecosystem for high-tech and Fintech start-ups, and an attractive regulatory and tax environment. Paris has been seeing more international banks and investment fund companies directing their business to the French capital, with over 5,000 financial jobs now being redirected to Paris due to Brexit, according to Paris EUROPLACE. de Bresson said that over 100 Chinese companies are now operating in France including Bank of China, Bank of Communications, Industrial and Commercial Bank of China and China Construction Bank, all which have increased their business volume in France in the past 10 years. "France welcomes Chinese companies and investment," said de Bresson. According to a 2030 action plan, Paris will continue to strengthen the attractiveness of its financial center in regulatory and tax matters; consolidate the position of the Paris market in corporate banking, insurance, asset management sectors with orientations on the financial innovation, fintech and sustainable finance; and strengthen the influence of the Parisian market at European and international levels. Asked about whether the ongoing "Yellow Vest" protests might undermine the attraction of Paris just as Brexit did to London, de Bresson said that he believes they are different. "The Yellow Vest protests took place because people who lose purchasing power want to express their dissatisfaction in the face of their financial difficulties. The French government has heard their call and is answering their grievances. Whereas Brexit is a more complex, lasting and maybe a more structural problem for the UK," de Bresson told the Global Times.